That we need money to live like it or not is a self-evident truism. Right? Not anymore. Drawing on almost three years of experience as The Moneyless Man, ex-businessman Mark Boyle not only demystifies money and the system that binds us to it, he also explains how liberating, easy and enjoyable it is to live with less of it. In this book, Mark takes us on an exploration that goes deeper into the thinking that pushed him to make the decision to go moneyless, and the philosophy he developed along the way. Bursting with radical new perspectives on some of the vital, yet often unquestioned, pillars of economic theory and what it really means to be ‘sustainable’ as well as creative and practical solutions for how we can live more with less Boyle offers us one of the world s most thought-provoking voices on economic and ecological ideas. Mark’s original, witty style will help simplify and diversify your personal economy, freeing you from the invisible ties that limit you, and making you more resilient to financial shocks. 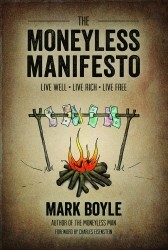 The Moneyless Manifesto will enable you to start your journey into a new world. An inspiring meditation on the divisive power of money, which also offers excellent practical suggestions for escaping its grip. The revolution before us is only worth joining if it goes to the depths that Mark has explored... it is my hope that this book will deepen its readers' belief in the possibility of such a world. Written with passion and outstanding integrity, Mark Boyle's latest book breaks new ground in the field of genuine sustainability. Boyle is living proof that it s not only possible to live without money, but that life is more heart-ful, more real, and infinitely more sustainable.